It’s a fresh new week and that means it’s time for another weekly update to keep you guys abreast of what’s in the pipeline. Let’s take a look what this week’s got for us! 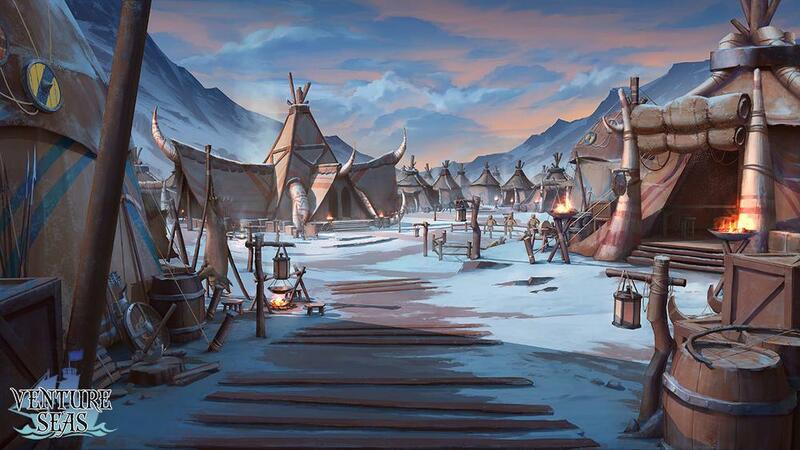 The picture above might have already given the game away, but as you can tell our resident and ever so talented background artist, Vincent Lau, has finished this wonderful rendition of the mighty nomadic city that you’ll be visiting in your adventures up North on the frostbitten continent of Palenisko. You could soon be finding yourself on the receiving end of the game’s new ‘request’ feature, wherein NPC’s will begin to make requests of you. You might need to go defeat a few enemies of a given type in a set location, or it could even be something as simple as delivering a specific item to someone. You’ll be able to complete these little errands easily during your adventures, helping you to earn a little extra on the side if you so desire. Work has officially begun on the next main chapter of the story, with plans coming together and writing getting properly underway. Who knows where your adventures will lead next? Well..The observant among us might have noticed there’s one continent we haven’t yet visited, but that might not be all there is left to explore. Hopefully we’ll be getting a glimpse of what awaits us in the weeks to come. That’s all for this week. Stay tuned for further updates, and of course the game review every Friday. Thanks for reading, and have a great week!